In this article, a DZone MVB and Vue.js expert shows three methods you can use for architecting an app for code splitting using Vue and Webpack. Code splitting a single page app is a great way to improve its initial loading speed. Since a user doesn't have to download all the code in one hit, they'll be able to see and interact with the page sooner. This will improve UX, especially on mobile, and it's a win for SEO, as Google penalizes slow loading sites. Last week I wrote about how to code split a Vue.js app with Webpack. Long story short, anything you wrap in a single file component can easily be code split, as Webpack can create a split point when it imports a module, and Vue is happy to load a component asynchronously. I believe the hardest part of code splitting is not getting it to work, but knowing where and when to do it. I'd go as far as to say that code splitting needs to be an architectural consideration when designing your app. If we make sure each page is represented by its own single file component, e.g. Home.vue, About.vue, and Contact.vue, then we can use Webpack's dynamic import function to split each into a separate build file. Then, when the user visits a different page, Webpack will asynchronously load the requested page's file. This is trivial to implement if you're using vue-router, as your pages will already need to be in separate components. Take a look at stats generated when we build this code. Each page is in its own file, but also note there's a main bundle file called build_main.js, which contains any common code as well as the logic for asynchronously loading the other files. It will need to be loaded no matter what route the user visits. Notice that the initiator of build_main.js is (index). This means that index.html requested the script, which is what we'd expect. But the initiator of build_1.js is bootstrap_a877.... This is the Weback script that is responsible for asynchronously loading files. This script is added to the build automatically when you use Webpack's dynamic import function. The important point is that build_1.js did not block the initial page load. 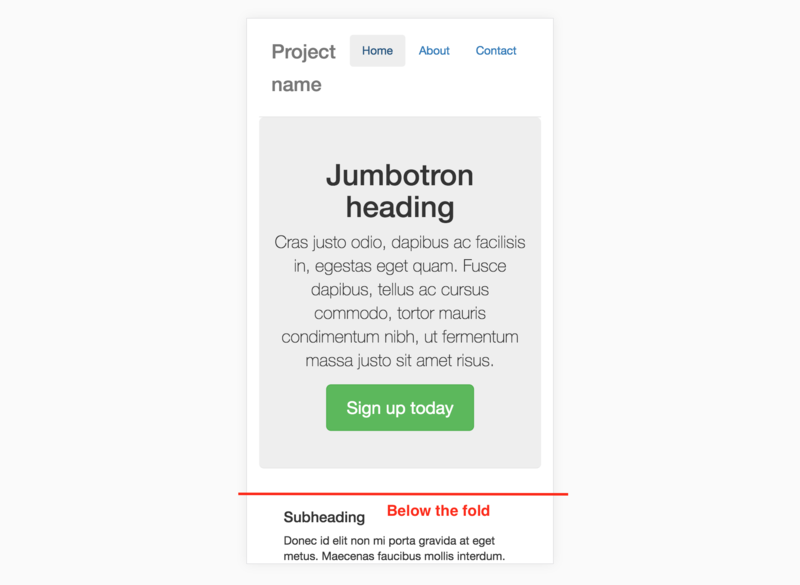 Below the "fold" is any part of the page that is not visible in the viewport when the page initially loads. You can asynchronously load this content since the user will usually take a second or two to read above the fold before they scroll down, especially on the first time they visit the site. Note: the below-fold chunk is very small (1.36kB) and it seems hardly worth bothering to split this out. But that's only because this is a demo app with very little content. 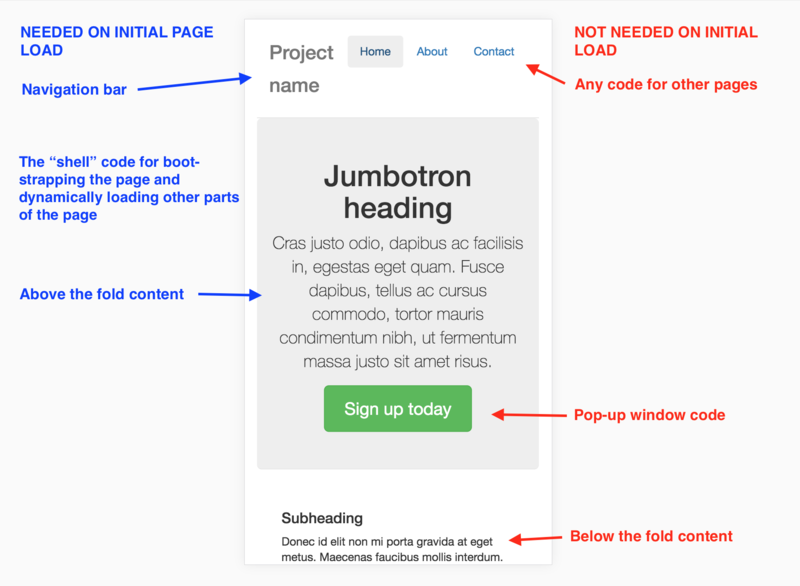 In a real app, the majority of the page is likely to be below the fold, so there might be a ton of code there including CSS and JS files for any sub components. Another good candidate for code splitting is anything that is shown conditionally. 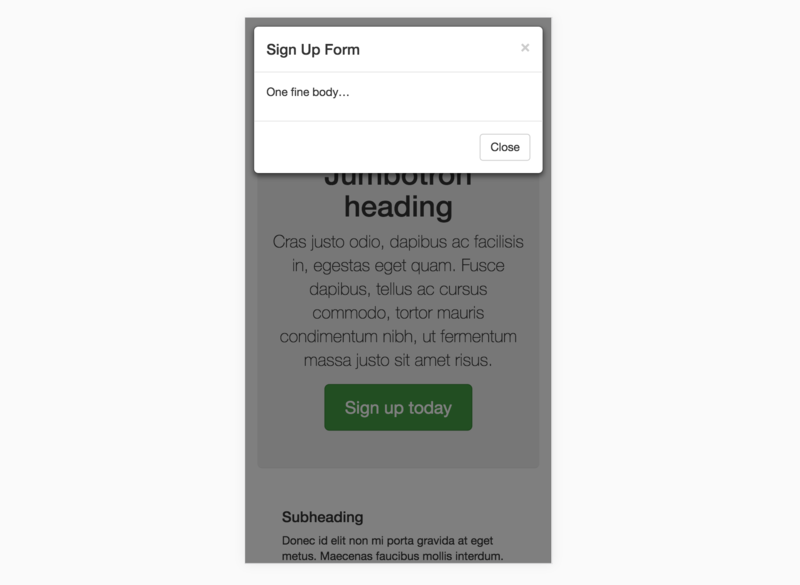 For example, a modal window, tabs, drop-down menus, etc. Notice that I've put a v-if on the modal. The boolean show controls the opening/closing of the modal, but it will also conditionally render the modal component itself. Since on page load it's false, the code will only get downloaded when the modal is opened. This is cool because if a user never opens the modal, they never have to download the code. The only downside is that it has a small UX cost: the user has to wait after they press the button for the file to download. Another ~5KB we don't have to load up front. Those are three ideas for architecting an app for code splitting. I'm sure there are other ways to do it if you use your imagination!